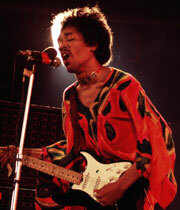 Jimi Hendrix is recognized as one of the most creative and influential musicians of the 20th century. His innovative style and explosive abilities on the electric guitar captivated a worldwide audience. During the early morning hours of August 31, 1970, during his last tour, Hendrix headlined the Isle of Wight Festival and performed before an audience of 600,000--the largest of his career. Three weeks later, Hendrix was gone. Academy Award-winner Murray Lerner captured the historic performance of the Jimi Hendrix Experience, including Hendrix, Mitch Mitchell and Billy Cox. Join us as we present Lerner's film, Blue Wild Angel: Jimi Hendrix Live At The Isle of Wight. The film, a testimony to Hendrix's incomparable musicianship and showmanship as well as Lerner's cinematic artistry, will be introduced by Janie Hendrix, the late guitarist's sister and President of Experience Hendrix LLC. Following the screening there will be a panel discussion moderated by the GRAMMY Museum's Executive Director Bob Santelli with Billy Cox, bassist of the Jimi Hendrix Experience and Jimi Hendrix Band of Gypsys, filmmaker Murray Lerner and John McDermott, Producer and Catalog Director of the Experience Hendrix catalog and co-author of Jimi Hendrix: Sessions: The Complete Studio Recording Sessions, 1963-1970 and Ultimate Hendrix: An Illustrated Encyclopedia of live Concerts & Sessions.